Journalists are busy reading the 2008 FOMC transcripts looking for things to write about. Matt Yglesias is no exception, and he has written a piece arguing that Ben Bernanke and his FOMC made a critical blunder on September 16, 2008, which was not to lower the fed funds rate target. So, it's like there was a fire at City Hall, and five years later a reporter for the local rag is complaining that the floor wasn't swept while the fire was in progress. Lehman Brothers filed for bankruptcy on September 15, 2008, and an FOMC meeting took place on September 16. On April 30, the target rate for fed funds had been set at 2%. On September 16, the FOMC agreed to keep the fed funds rate target constant at 2%. Seems like this was pretty dim-witted of the committee, given what was going on in financial markets that very day, right? Wrong. At that point, the fed funds market target rate had become completely irrelevant. 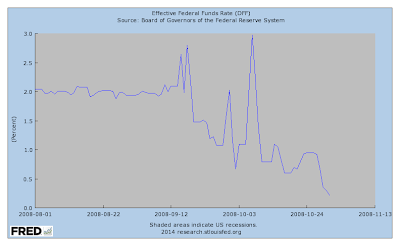 First, here is the fed funds rate for the period 08/01/08 to 10/31/08. You'll note that after about September 12, the Fed could not even hit its target. The fed funds market is an unsecured overnight market. Given the disruption in financial markets at the time, fed funds lending had become quite risky, with risk depending on the borrower. So, the effective fed funds rate reflected a substantial amount of risk at the time - we're not looking at some risk-free rate. Further the effective fed funds rate does not reflect all of fed funds market activity. In fact, a majority of fed funds trading is not even included in that measure. At the time, there would have been good reason to think that the actual average interest rate on fed funds trades was substantially different from the effective fed funds rate, as measured. The Fed had already been lending in a big way, before the Lehman failure, in part through the Term Auction Facility that had been set up a year previously. Further, that lending increased from $169 billion on September 10, to $268 billion on September 17, and to $543 billion on October 1 (the quantity is measured weekly). So, though the FOMC didn't change the fed funds rate target in mid-September, the regional Feds were extending credit massively to the financial system through the month of September. 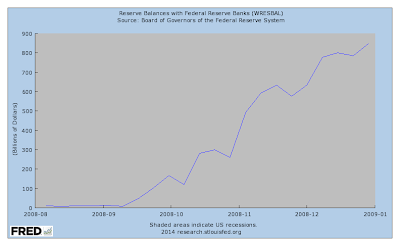 In particular, reserve balances went from $9 billion on September 10 to $47 billion on September 17, to $104 billion on September 24, to $167 billion on October 1. To put this in perspective, daylight financial transactions through the Fed can be supported with a small quantity of reserves. That quantity was sometimes about $5 billion before the financial crisis. So, $47 billion in reserves is a big number. Indeed, it may be a large enough quantity to drive the risk-free overnight rate to its lower bound, which at the time was zero - the interest rate on reserves. 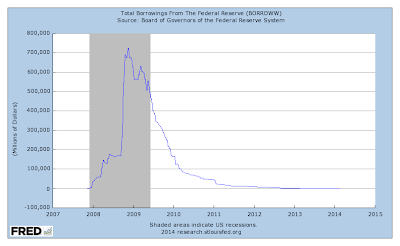 On October 1, 2008, the Fed began paying interest on reserves at 0.25%, and that became the floor rate at that time (though for technical reasons the fed funds rate currently is below that rate). 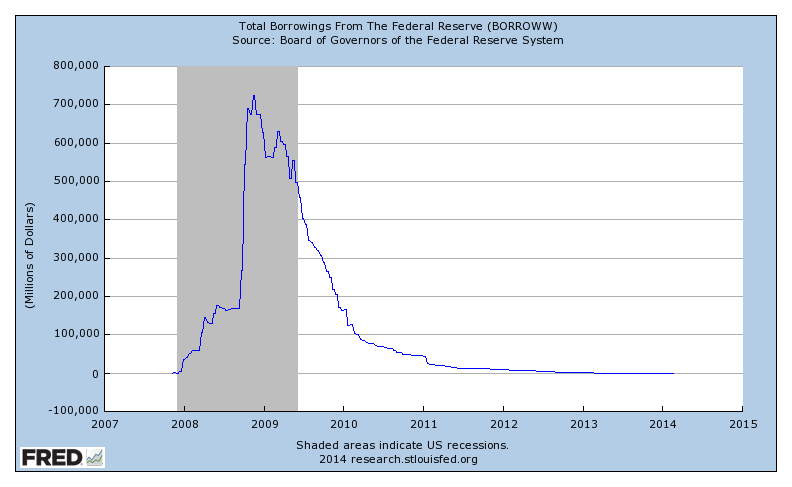 Thus, by September 16, 2008, it seems the Fed was effectively already at the zero lower bound. At that time the fed funds target was irrelevant, as there were excess reserves in the system, and the effective fed funds rate was irrelevant, as it reflected risk. Note, for example, that by October 31, when the interest rate on reserves was 0.25% and the fed funds rate target was 1%, the effective fed funds rate was 0.22%. As I discussed in this post, much of what we would like to know about the financial crisis and the policy response cannot be found in FOMC transcripts. Some of the key Fed interventions had to do with: (i) Who borrowed how much and at what rate from the Fed, and what were the related conversations that went on between Fed officials and the officials of the large financial institutions involved? (ii) What assets were purchased by the Fed from what financial institutions, and at what price, and, again, what were the related discussions that occurred involving the Fed and the officials of those financial institutions? Further, we know that the Treasury was involved, and we would like to know what was discussed vis-a-vis the Fed, the Treasury, and the financial community. Matt Yglesias's piece is written like a blog, not like a well-researched piece of journalism. He cites the FOMC transcripts, and then provides his own interpretation of what is going on. Apparently, there was no attempt to check this with anyone who might have some expertise. Nevertheless, Yglesias is willing to level the charge that the guy who ran the Fed during the crisis made a "big mistake." Unfortunately, it's Yglesias that is making the big mistake. "So, though the FOMC didn't change the fed funds rate target in mid-September, the regional Feds were extending credit massively to the financial system through the month of September." Good post. As Stiglitz taught us long ago, we cannot just look at prices, i.e. loan rates, in financial markets, we also gotta look at quantities. Your points are true and interesting, but don't include any argument that monetary policy was not too tight and that the Fed did not make a big mistake not to have announced any further easing. 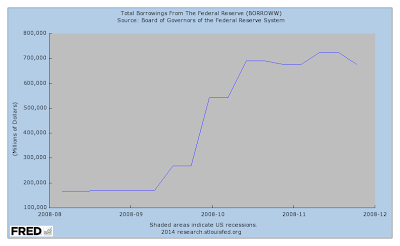 Well, there was a massive amount of Fed lending. The overnight rate was effectively zero. The only other type of "easing" that was not done in September 2008 would be asset purchases - long Treasuries and MBS - which didn't start until January 2009. Not clear that would have made any difference. I think Matt's point is that Fed was not doing enough relative to size of the problem. The list you give above means nothing without knowing how much of each category was optimal. 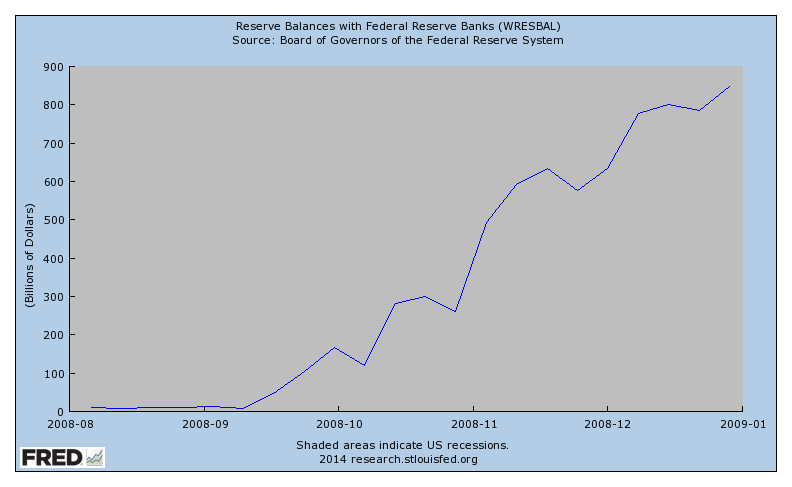 It may be the Fed's actions needed to be done on a larger scale to effectively stem the crisis. You have not shown otherwise. No, his point was that the Fed made a mistake by not reducing the fed funds rate target on September 16, 2008. Same with all these people latching on to Yellen's comments in Jan about the economy being on the brink of recession. By June, a little bit better data had her proclaiming the economy had turned a corner and that the Fed would be raising rates by 2009. No one seems to mention that. she is a trend follower. Yes, crisis intervention is not about conventional monetary policy. I'd be curious to know how much, and in which direction, the TIPS spread moved after the FOMC announced its decision on the FFR target on September 16, 2008. Not much going on, if you look at the data. Why would you think that was significant? Not sure who you're talking about, but it can't be me. Noah please get working on your research. It is going to be embarrassing when you are denied tenure and all you have to your name is your blogging career. Presumably market participants had worked out their forecasts for the forward path of inflation conditional on the Fed standing pat on the FFR target. If the decision was impactful, we should have seen movement in the TIPS spread in the minutes following the announcement. Suppose you had seen movement in the TIPS spread. With all the other stuff going on, how could you conclude that this had anything to do with what the FOMC did? We have a sample size of 1, and the study is observational, but what exactly is the alternative? If you zero in on the immediate reaction, as compared with the moments before, you're isolating the effect as best you can. It's got all the problems of any event study, plus the added feature that this was a time when something big was happening every day in financial markets. On the view that the Fed always and everywhere controls the rate of inflation, it would seem that what the Fed actually does with what it treats as its primary instrument would tend to dominate other concurrent effects. Of course, I realize this is far from your view. The bigger problem, though, is that the quality of the TIPS spread as a gauge of expected inflation probably deteriorated during the flight to Treasuries at this particular point in time. who in their right mind believes the fed "always and everywhere" controls the rate of inflation? The only thing most people say is the fed controls nominal interest rates or the growth rate of money and can use these policy instruments to try and influence inflation. "The bigger problem, though, is that the quality of the TIPS spread as a gauge of expected inflation probably deteriorated during the flight to Treasuries at this particular point in time." I'd say that another way. Effectively, the Fed had lost control of financial markets at this point - they couldn't control anything. So whatever you could see in asset prices could not reflect what the Fed was doing. Fair enough, but one can use "control" in different senses. It's possible that an omniscient Fed is always able, in principle, to hit any given inflation rate, and in that sense the Fed controls inflation, while the real world Fed, which is anything but omniscient, lacked control. But the lack of control is not because they didn't have the right levers--it's because they didn't know what the consequences of pulling the levers would be. Again, this isn't your view, but one can consistently maintain that a monopolist in the base money market is always "in control" of inflation, and also believe that in practice the Fed "lost control" of inflation due to its inability to decipher the storm of events unfolding. You seem to be contradicting yourself. The point is that the Fed was in a situation where turmoil in financial markets implied that they coiuldn't peg any asset prices in the way they normally do, nor could anyone make infrerences from asset prices in the usual way. Fed actions at the time would have effects, but unpredictable ones, and events in financial markets were swamping what the Fed was doing. So, at the time, the job of the Fed was to get things "under control" as quickly as possible, so they could get back to policy as usual. A financial crisis is a time when inflation control doesn't enter into the decision-making process. I see. We're in agreement that the contemporaneous level of the FFR, in and of itself, was irrelevant to the events in financial markets, which in turn interfered with the normal effects of adjustments to the FFR. Still, had the Fed committed to a low FFR as long as would be needed to hit its inflation target, or even better a price level target, this may have reduced the stress in financial markets, restoring some of the effectiveness in FFR adjustments. And then lowering the FFR as well might have helped. Indeed, without lowering the FFR simultaneously, it's not clear that such a commitment would have been credible. We're in agreement, though, that an isolated lowering of the FFR would by itself have been irrelevant. I completely agree with your assessment of fed funds market - an issue that is mostly ignored elsewhere. However, the fed funds rate decision was still extremely important, as the target fed funds rate served as a signaling device. On October 22, the Fed raised the interest on reserves to raise the effective fed funds rate towards the fed funds rate target. Prior to that, the Fed mostly acted to reduce the effective fed funds rate towards the target. I also disagree with your description of daylight credit. For example, at the end of 2007, the peak daily overdraft has reached above 140 billion dollars, serving as a substitute for reserves. 1. 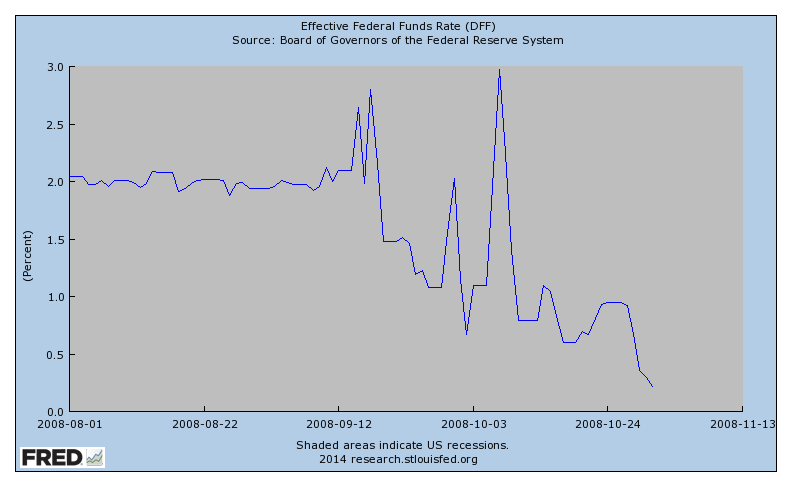 It's a bit odd to think of the fed funds rate target as a signal in mid-September 2008. The people on the FOMC, and participants in financial markets were all confused about what was going on, so it's not clear exactly what the fed funds target would be signaling - the important messages were what Fed officials were saying in public. You could possibly make a case that the FOMC thought that reduction in the target would signal panic, but I don't know if you can find that in the transcripts. In any case, if everyone had understood what was going on, they would have understood that the decision about the target was meaningless. 2. Very good. Yes, for daylight transactions, it's not the overnight reserve balances that matter of course, and we have to take account of the Fed liabilities that are created during the day, i.e. the daylight overdrafts. My point was just to establish that there was a substantial quantity of excess reserves in the system overnight by mid-September, so that the riskless overnight rate was essentially zero. - Was the mess in fed funds market the most important problem the Fed had to address? Yes, I think we agree here, although I have to tell you the ECB was more successful in doing this than the Fed was. The ECB kept the rates higher than the Fed, but this was more than compensated by better control of money markets, and accordingly euro inflation expectations were more stable. - Was the September 16 fed funds rate decision important? Here we disagree. In my view, failure to cut the fed funds rate target has signaled an important change in Fed's reaction function. In early 2008 the Fed reacted to credit stress by cutting rates, this was different in September, and markets have reacted to this change. Paradoxically the limited ability to actually implement the decision has increased its importance. Unprecedented events in credit markets have reduced the ability to control the effective fed funds rate while raising the signaling importance of fed funds rate target. Anonymous, the ECB was successful in the initial phase of the crisis (2008-09). We can debate what has happened after that, but that does not change the assessment of 2008. On one hand, we can say that the ECB was wrong in raising the interest rates in 2011. But wait, the ECB was following the prescriptions of Taylor-like rules. So maybe we can blame John Taylor on the lost decade. Or maybe not, as the same rules will ensure the subsequent recovery. On the other hand, the ECB has prevented Greece from escalating into Lehman II. This is important, as the Fed is still struggling with TBTF problem, while the ECB has demonstrated that it is possible to solve it. Um, perhaps the Taylor rule is best understood as a rule of thumb to model how a central bank reacts. However, the 2011 rate hike was only sensible if you thought baseline inflation was more meaningful than core inflation. That is the mistake the ECB made. Sometimes people seem to forget that the reason we target inflation is because people believe it isncaused by some of the more fundamental aspects of an economy we do really care about. "the reason we target inflation is because people believe it isncaused by some of the more fundamental aspects of an economy we do really care about." No, we target inflation because: (i) high inflation is costly; (ii) variable inflation is costly. We also target inflation because (iii) low inflation / deflation is costly. Behind my point there is some actual economics, deflation increases real interest rates and makes monetary policy less effective. High or volatile inflation on the other are no problem in a rational world due to indexing. So if you claim that high and volatile inflation are problematic you implicitly admit that the world is far from perfect and rational, that there are ample of market failures that prevent indexation. The fact that labor contracts and debt contracts are not indexed is consistent with rationality. You cannot on the one hand claim that high inflation implies significant costs and on the other hand claim that not reducing these significant costs via indexing (which should be virtually costless in the digital age) is rational. Doesn't undo the contradiction though. Not that I did expect any sane, non-contradictionary arguments of the inflation-phobic hard money folks who predicted that QE will lead to 5% inflation in the first place. Matt Yglesias is hustling for a Pulitzer Prize in commentary. The bad part of this is that he's just stating an opinion. It's not conventional reporting, but what would be on the old-fashioned op-ed page. On the op-ed page of his middle school newspaper. I don't see anything above that weakens yglesias's argument. If anything it strengthens it in my mind. As you so ably demonstrate the FED was largely dealing with the bank situation. The argument is that in reality the real economy was in a lot more distress than the FOMC realized because they were too focused on the bank crises. The fed funds rate is the wrong tool to fix the contain problems with Lehman and the FED was using the proper tools. The FOMC had all the data before them and decided to ignore the signs when everyone seemed to expect a rate cut (even according to the FED). The target rate has always been the primary communication tool of the FED. To say that enough people took the time to parse a FEDspeak statement by the FOMC instead of looking at their actual announced actions seems ridiculous. Expectations are always a tricky subject in economic thought but I would assume the argument is that the 'economy' realized that the FED was ignoring what really mattered for the rest of the economy because they were to deep into dealing with the more acute crises. It is almost as if they were arguing how to prevent hitting another iceburg while the Titanic was sinking. I think you see that, in practical terms, a change in the target rate at that time would have done nothing. It's announcing a change in the target for something that was well out of the Fed's control (because of risk in the fed funds market), and the riskless overnight rate was effectively zero anyway. But perhaps, as you say, the Fed could have communicated something to financial markets by lowering the fed funds target. But what exactly? You could say that this would have signaled that the Fed was being aggressive in dealing with the problem. 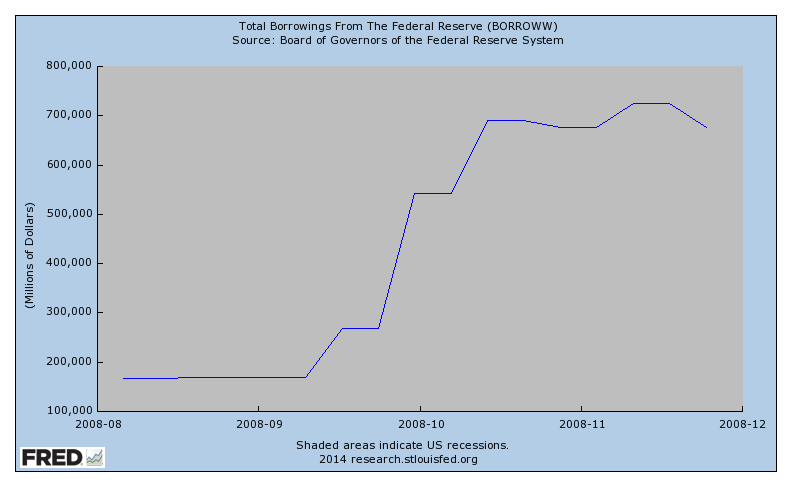 Of course, for anyone who was watching what the Fed was doing, it was clear that it was aggressively lending. There's no hint of the Fed standing by and watching things go down. So what would a target rate cut have contributed? It actually might have signaled panic to the markets. So, big mistake? I don't think so. Fed Chair From Business, not Academia? I have a friend who owned an auto repair shop back in the days when PCs were relatively new. Things had gotten big and profitable enough where he thought that computerizing sales, purchasing, and inventory was looking attractive but none of the commercial software could do what he wanted. So he hired a customer who was an experienced programmer to do it for him and after perhaps 2 years of inadequate results, he came to the conclusion that it would be easier to hire someone who knew the car business the teach him to program than the reverse. Perhaps we should be hiring businessmen to run the Fed and letting them learn the fine points of monetary policy. It is impossible to teach the gut-wrenching immediacy of some decisions unless you are financially involved in a very significant way. Paulsen had business experience, but may have needed less banking and more non-financial experience like Gerstner or Jack Welch both of whom had to manage significant financial arms of their business. I don't think so. It's easier to teach an economist about "gut-wrenching immediacy" than to teach a business person economics. "Another interpretation: They underestimated the harm done by ignoring clear and unequivocal evidence that the situation called for looser monetary policy. Markets were expecting a rate cut." Chairman Ben Bernanke and other members of the Federal Reserve's interest-rate-setting committee voted unanimously on Sept. 16 to leave the federal funds rate at 2%, disappointing bankers who had expected a cut of a quarter or even half a percentage point to stimulate the U.S. economy and lower their borrowing costs. The Federal Open Market Committee acknowledged growing troubles in the financial and labor markets but said: "The downside risks to growth and the upside risks to inflation are both of significant concern." There's plenty of actual reporting about what various investors, bankers, etc., expected at that meeting and why, and the actual investment decisions made as a result of that meeting that does not support your claim that a rate cut would have meant nothing. Are you claiming these Investors, etc., with real money are fools, or that the reporting of what they say they are doing is false?